HUNTINGTON, W.Va. – There were turnovers on punt returns, and another on a mishandled kickoff return. An extra point was blocked in the first quarter, and a punt blocked in the fourth. A bobbled pass turned into an interception, and the giveaways piled up. None of those blemishes were what Marshall head coach Doc Holliday focused on the most in the wake of a 32-16 win against visiting Eastern Kentucky on Saturday night here at Joan C. Edwards Stadium. "You don't ever want to apologize for a win," he said to the media gathered in the Shewey Building. Holliday's Herd is, after all, 2-0 through the first two weeks of the regular season. That was the goal, of course, even if the road there wasn't as smooth as Holliday or anyone else associated with the Marshall football program would have liked. "I was disappointed in some things that happened out there today," Holliday said. "That's not normally us." Holliday is correct. In his nine seasons at the helm, Saturday was the 13th time his team has committed four or more turnovers. After the win against EKU, Holliday's record in those games is 2-13. It is not often a team can overcome as many self-inflicted wounds, but that is what breathes life into Holliday's unapologetic words. The other win with four turnovers: Conference USA's 2014 title game against Louisiana Tech, a 26-23 Herd win. "We found a way to win the game," Holliday said, "which is what matters." It seemed, at the outset, that Marshall might get to its goal with ease. 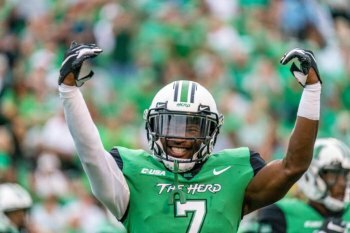 The Herd (2-0) opened a 6-0 lead when redshirt freshman quarterback Isaiah Green connected with junior receiver Obi Obialo for a 20-yard touchdown. The extra point was blocked. A few minutes later, senior receiver Tyre Brady caught a 6-yard touchdown pass from Green, who was making his second career start. Brady has 11 career touchdowns in 14 games since joining the Herd. After holding a 13-0 lead, EKU cut the deficit early in the second quarter when LJ Scott scored from 2 yards out. The Herd answered when Tyler King scored from 5 yards out following a 29-yard interception return from senior linebacker Frankie Hernandez. That was Marshall's third interception of the first half, with others by sophomore safety Brandon Drayton and junior cornerback Jaylon McClain-Sapp. That is how Marshall managed Saturday night. A fumble or folly was neutralized by a defensive stop of takeaway. The Herd is 5-0 under Holliday when it turns over the opposition at least five times. "We put (the defense) in a lot of bad situations," Holliday said, "but they created five turnovers." The Herd held a 20-6 halftime edge and was prepared to return the kickoff to start the second half, but the ball was booted around and recovered by EKU. The Colonels scored with 12:28 left of the third quarter to make it 20-13, making the 24,304 a little uneasy on dreary night. Marshall answered with a five-play, 55-yard scoring drive that was punctuated by another Green-to-Obialo hook-up, this one from 40 yards. Both of Obialo's catches went for touchdowns – the first two of his MU career – and both came on so-called "free" plays in which the defense jumped offside and allowed Green to throw to the end zone and let Obialo make a play. MU kicker Justin Rohrwasser added a 35-yard field goal midway through the fourth quarter to make it 30-13. A Herd safety with 3:06 left made it 32-16. Overall, Green finished 23 of 39 passing for 278 yards, three touchdowns and an interception. He has 550 passing yards this season, the second-most for any Marshall quarterback in program history through his first two career starts. Brady led MU in receptions (six) and receiving yards (66) again. Sophomore tight end Xavier Gaines added three catches for 60 yards, both career highs. The ground game sputtered, and sophomore receiver Willie Johnson carried twice for 36 yards to lead the team. "We didn't run the ball as well as I like," Holliday said. The defense made amends. EKU was held to 11 first downs, 139 rushing yards (a week after gaining 404 on the ground) and 48 passing yards. The Colonels' 187 total yards of offense are the fourth-fewest allowed by the Herd under Holliday, who has been the coach for 105 games. Senior linebacker Chase Hancock paced the defense with 12 tackles, one sack, one tackle for a loss and a forced fumble. Junior safety Malik Gant added 11 tackles, including one for a loss. The team finished with six sacks, two forced fumbles, two fumble recoveries, three interceptions and 11 quarterback hurries. Senior defensive lineman Malik Thompson finished with a sack, tackle for a loss and three quarterback hurries. He also tipped a pass at the line of scrimmage that led to an interception. Those are highlights to Holliday, but the special teams play will weigh on him as Marshall begins preparations to travel to face South Carolina next Saturday. "It was very frustrating," Holliday said. "We hadn't seen that around here in a long, long time and you won't see it again."